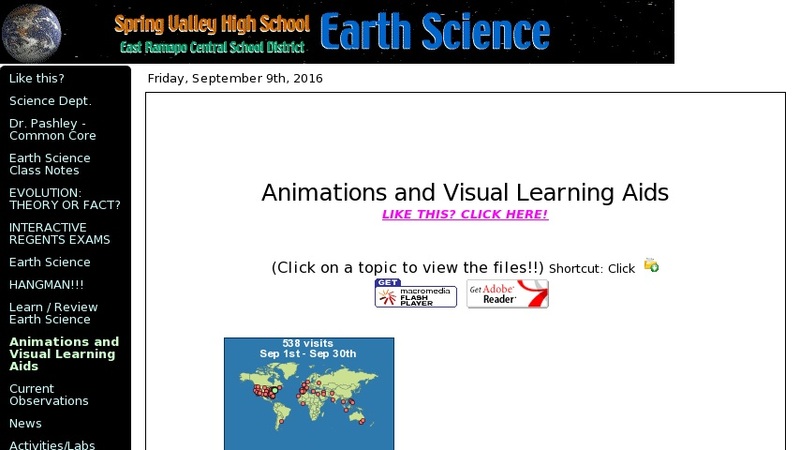 There is a lot of information packed into this Flash animation. Find the path of the sun above the horizon (on the celestial sphere) for four locations (both poles, equator, and 41 degrees north) during equinox and solstices. An important point that can be extrapolated from this animation is that although each pole has perpetual day during its respective summer solstice, the sun never exceeds around 24 degrees above the horizon. Given the sun�s oblique rays, there is enhanced atmospheric scattering and absorption resulting in lower temperatures. In addition, ice shelves and glaciers promote high albedos, further lowering temperatures. Thus, it�s a refrigerator even during perpetual day. The animation can easily be rewound or paused to stress important points.